Einstein says: How often should I oil my bike chain? Einstein is well versed in all things mechanical seeing that he is resident dog at our bike store in Dublin. He has a few words on how to look after your bike, with simple maintenance tips and advice and will be answering the questions we get most asked the most. So stay tuned to our new Einstein says section! People often ask me ( yes they do) how often they should oil their bike chains and the answer is always the same: regularly. 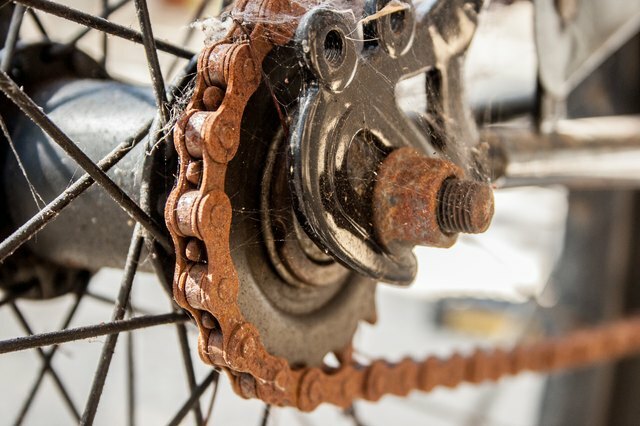 A clean well lubricated bike chain will keep your bike running in optimal health but under or over lubrication will cause problems too so it can be tricky to get right. If the chain is too dry it can cause friction but if there is too much lubricant it can cause dirt and debris to build up. An easy way to determine how often to lube your chain is to do weekly visual check. If you are a regular cyclist (over 100km a week) have been on long bike rides or have had bad weather on your weekly commute then a quick clean and lube is necessary. Clean bike chain and remove dirt with cloth before applying fresh lube. Clean chain rings on both cranks and hub. Use a good quality bike lubricant (we sell ’em) not standard oil. Inspect chain every week. Look for signs of rust and wear and tear. Remember the oil and cranks are the engine of your bike and a well look after engine will quadruple the lifetime of any vehicle. Thanks for reading, I’ll be doing a series of bike maintenance and tips and advice regularly (between walkies) so stay tuned! We are The Bike Institute – A retail and online store dedicated to all things bike.Our mission is to give the best advice, service and bikes for you and never try and oversell. We are Dublin’s friendliest bike store so drop in and say hi.